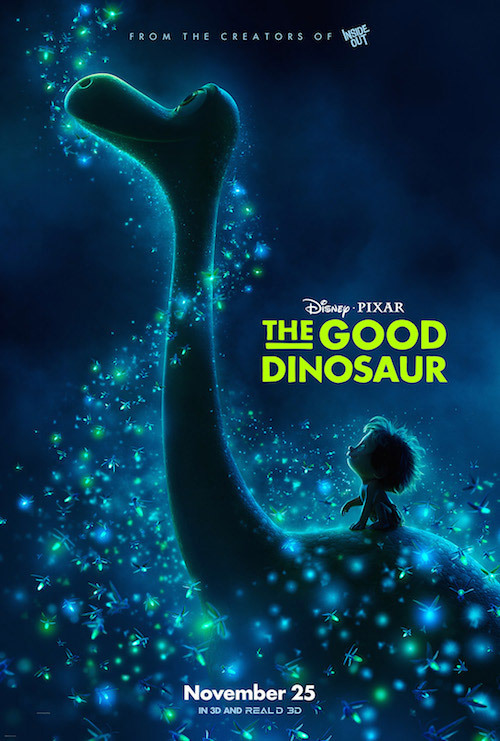 A deeply resonant and visually breathtaking journey through the wide open frontier, The Good Dinosaur utilizes a high concept to explore the prehistoric friendship between a talking dinosaur and underevolved little boy. The greatest threat facing this latest film from the geniuses at Pixar is not extinction, but rather comparisons to their own masterpiece Inside Out, which the studio just released earlier this year. But even with these lofty expectations to be met, The Good Dinosaur still roars to life with a beating heart of its own. This is a unique and emotional piece of work in itself, an animated western that often unfolds with minimal dialogue and finds an almost wordless beauty through many of its images, exploring surprisingly moving themes of confronting grief and overcoming fear to find your own place in the world. The film imagines a world where the asteroid just missed our planet and dinosaurs never went extinct, allowing them to develop speech and evolve into the dominant life form, with the humans remaining more primitive and animalistic. The title dinosaur is Arlo (Raymond Ochoa), an apatosaurus who was the smallest hatchling of his family and has grown up trying to leave his mark on the farm and protect his Momma (Frances McDormand), following in the footsteps of his beloved Poppa (Jeffrey Wright). But when tragedy strikes and the scared young dinosaur is separated from his family, and left with a feral human child named Spot (Jack Bright), a bond forms between them as they journey together across the wide open landscapes, struggling to survive on their own and meeting a unique cast of characters along the way. This includes a cult-like group of pterodactyls led by Thunderclap (Steve Zahn), who worship the weather and live by the survivalistic creed of “the storm provides,” a gang of viscous hillbilly raptors, and a family of T-Rex ranchers headed by the tough and golden voiced Butch (Sam Elliot). Like many films in the Disney and Pixar library, The Good Dinosaur centres around an unlikely pairing, two very different characters who ultimately become friends. If Lilo was a dinosaur and Stitch had been a human child, this is what their friendship might have looked. This is very much a coming of age journey, set against the backdrop of the wide open frontier, with crops of corn needing to be stored in order to survive the winter, as severe weather and other forces of nature provide the strongest threats. This world is richly textured and explored, capturing a sense of both great promise of the untamed land and grave danger in the form of the uncontrollable elements. With the infamous amount of production troubles behind The Good Dinosaur, including multiple shifts in release dates and a change in director that led to a complete overhaul of the film and initial voice cast, there are a few moments here that don’t feel entirely fleshed out. The story does have some visible seams, and the narrative sometimes treads down a bit of a familiar path. But make no mistakes, this is still an incredibly solid film, and even if it can’t quite scale the heights of Pixar’s absolute best work as a whole, it’s a big step above the majority of other animated entertainment. Making his feature directorial debut, veteran animator Peter Sohn has crafted a highly cinematic and often epic adventure, that manages to unfold in ways that are always engaging to watch. The film has elements of a classic western, both in structure and tone, and also doesn’t shy away from having its characters bare their teeth or showing the harsh realities of the natural world, with moments of thrilling peril. This is matched by some elements of dark and almost absurd humour, including a truly trippy and hallucinogenic sequence involving fermented fruit. It’s essentially an animated drug trip. The photorealistic backgrounds are quite simply breathtaking, boasting some of the most beautiful computer animation ever put on screen. The details of the natural world, including leaves and clouds that all move realistically, create a luscious backdrop for the highly stylized characters. The interludes involving fireflies lighting up the night sky are gorgeously done, and the water is like a whole other beast within the story, appearing vivid and lifelike. The sweeping music by Mychael and Jeff Danna, mixing elements of country guitar and classic Americana, provides eclectic and hypnotic accompaniment. There is some beautifully done stuff here, and at its absolute strongest, The Good Dinosaur features a few of my favourite moments that the studio has ever done. Some of the most touching scenes are the quiet conversations and wordless exchanges where we really feel the bond between Arlo and Spot, and the moment when they silently reveal their shared grief is one of the most tender and touching of any film this year. This scene captures such a powerful and sorrowful sense of feeling that it could easily be seen as the centrepiece of the entire film, and a dreamlike sequence near the end reveals itself to be both genuinely haunting and moving, with spiritual and almost mythic undertones. Although The Good Dinosaur is inevitably going to face lofty comparisons to Inside Out, a fate that was destined to befall any film following what is arguably Pixar’s finest achievement, this has the potential to become an underrated classic in the studio’s oeuvre. With breathtaking animation and a touching story about the bond between a dinosaur and his boy, this is an engaging and heartfelt coming of age journey, that unfolds against stunningly rendered landscapes and features some beautifully done sequences. Playing before the film is Sanjay’s Super Team, the story of a young Indian boy who would rather watch cartoons instead of saying prayers with his father, leading him to imagine the Hindu Gods as his favourite team of superheroes. A deeply personal project, inspired by director Sanjay Patel’s own childhood experiences, Sanjay’s Super Team is visually stunning and emotionally resonant, providing a spectacular and highly stylized introduction to different religious beliefs. It’s not only my favourite short film that the studio has done in the past few years, but also one of their best.